I’m sure you already know that Birchbox is one of my favorite monthly beauty boxes. I have subscribed to them since they started way back in 2010. 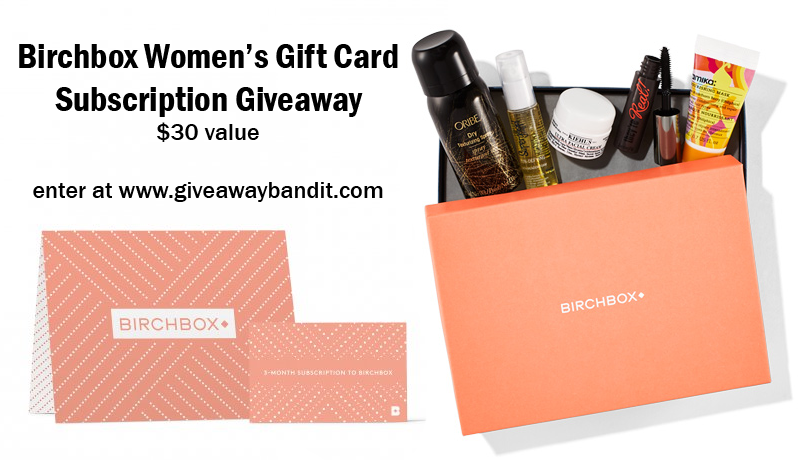 Since we love them so much, we are giving away one Birchbox women’s gift card subscription ($30 value). Each box includes five beauty samples from high-end brands. The perfect prize to glam yourself up for the holiday season! Giveaway ends November 23, 2016 at 11:59 pm EST. Giveaway is open to the US only, ages 18 and older. Enter to win via the giveaway form below and good luck! Giveaway Bandit was not compensated for this post. We are not associated with any of the companies named above. No purchase is necessary to enter. Void where prohibited by law. The odds of winning are based on the number of entries received. Open to the United States, 18+ only. Confirmed Winner(s) (by Random.org) will be contacted by email. Winner(s) have 24 hours to respond before a new winner is chosen. This event is in no way administered, sponsored, or endorsed by, or associated with, Facebook and/or Twitter, Google, Pinterest. This disclosure is done in accordance with the Federal Trade Commission 10 CFR, Part 255 Guides Concerning the Use of Endorsements and Testimonials in Advertising. I’ve taken the quiz 5 times and the videos just keep playing and the next button will not work for me. It doesn’t tell me what kind of thanksgiving. I am a DailyBreak member, does that matter? I realize it’s probably my obviously less than average knowledge of everything that’s the problem and I promise I do not mean that toward you in any way, I promise I do not. You are generously offering this giveaway.